Neelikon offers high quality Colours for manufacturing various types of stationary and inkjet inks. In stationary ink Neelikon has water soluble Colours (food colours) used in Children Sketch Pen. These colours meet EN/71 requirements. Neelikon is also one of the few producers of Solvent Green 7 (Pyranine) C.I. No. 59040. Our organization is one of the primary manufacturers and exporters of alternate domino™ general purpose ink like continuous industrial inkjet inks, industrial inkjet inks etc. 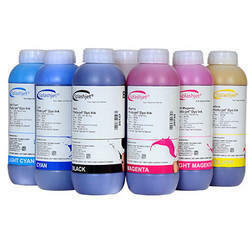 These inks are known for high quality, excellent printing and fast drying. These inks are utilized for general purposes and can be availed at industry leading rates. The ink is water based dye ink which is very effective and fade resistant and water resistant as well. It lasts long without lamination. dries immediately giving high resolution images of upto 5760 DPI quality. The ink is cost effective and highly durable for upto 20 years without fading. Banking on our enriched industry experience, we are able to supply Black Ink. AEPL inkjet inks are imported from very reliable sources, keeping in mind customers needs and requirements. AEPL Inks are tested, keeping in mind OEM quality standards. AEPL Inks when used, produce sharp, clear printouts, which nearly matches OEM outputs.